As I walked along on my trails I saw something unusual. 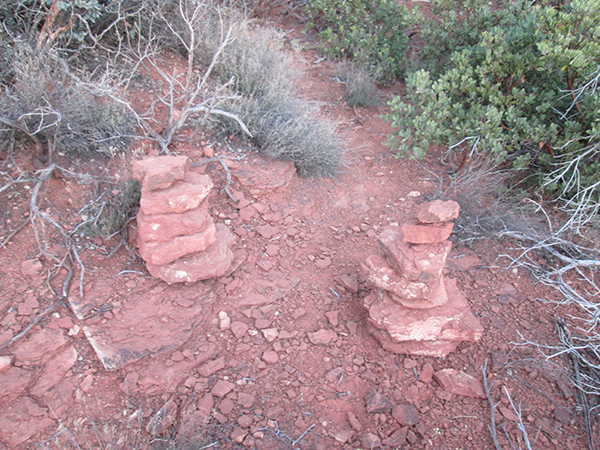 New trail markers – one on each side of a trail. Where there had been no trail the day before. Strange. I didn’t know trails could just pop up like that. Well, if there’s a new trail I guess I’d better explore it. 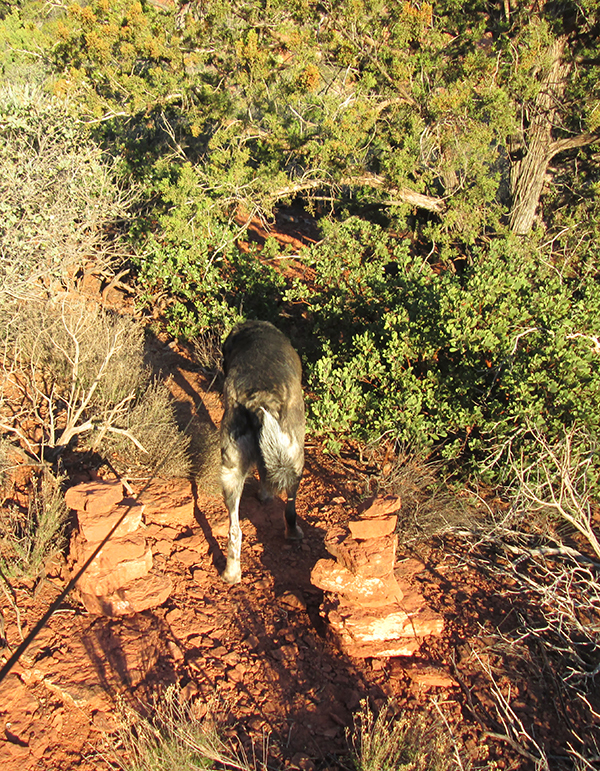 So I went between the markers and started to wander down the trail. It was such a new trail that I thought it was going to fizzle out. It almost did – but it didn’t. And you know where that trail took me. Right to that place where I found those aliens the other day. The ones that had turned to stone. I posted about it here. But something had happened. The aliens were gone. This is really serious because I thought I was safe. I thought that since those aliens had turned to stone they were stuck and couldn’t go anywhere. Now I don’t know where they are. They could pop out at any minute and I have no idea if they are friendly aliens or not. Aliens could be lurking anywhere on my trails – ready to jump out and get me. I don’t know what to do, but I might need your help. Those aliens look like piles of stones, so if you see anything suspicious could you let me know? I don’t want to be caught unawares. Look out Bongo!!! There is one right behind you!! You better WOOF at it to scare it away! Where! Where! I don’t see anything. Oh-oh, better be very careful on your trails! Pee on EFURRYTHING! Wooooowoooooo! Ku, I’m afraid that when I peed on that one alien awhile back that that’s what brought him back to life. Now I have to look before I pee to make sure it’s not an alien. Fredrieka, it’s probably all those things. People are always piling up stones around here for one reason or another. It might be okay if the stones didn’t get up and leave after awhile. Little Binky, you’re right. They might grab me. Maybe they’ll give me loves. Tuxedo Jack, I’ll make sure I guard my person from now on. So what is your conclusion regarding those aliens? Lily, I’ve been walking with care on my trails. I’m still waiting for one to jump out at me. Cupcake, usually I would invite you to share my trails with me, but maybe you better wait till I get those aliens chased off. 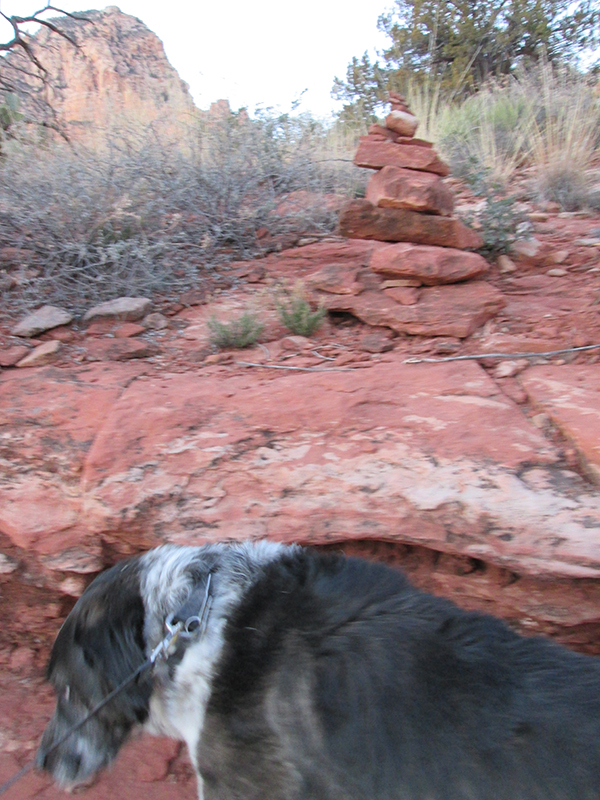 Those stone piles might also be aliens’ or alien dogs’ postboxes for pee-mails. Kolytyi, I think they must have something to do with alien dogs. I’m checking out every dog I see on my trails now. You just never know with aliens Bongo. If I were you, I’d carry a bag of Reese’s pieces just in case – they all love Reese’s pieces. Lola, maybe I could make a trail of Reese’s Pieces that heads over a cliff. That would take care of those aliens. Dalton, I’m still trying to figure out those aliens. Hmmm…I didn’t know that those aliens have been still thinking to take over your trails….You might want to call ” Aliens Hunter” for your trail safety! Kevin, I’ve sure got to do something about those aliens. I never know when they might jump out at me.